Committed to providing a peaceful resting place for the faithful departed, the staff at Saint Mary’s Cemetery work hard to help families remember their loved ones through decorations, monuments, gravestones, plot maintenance and more. The cemetery is situated along rolling hills in the Mississippi River and maintains over 80 acres of grounds. In recent years, Saint Mary’s Cemetery has been working on a genealogy database to help family reunite with departed relatives. 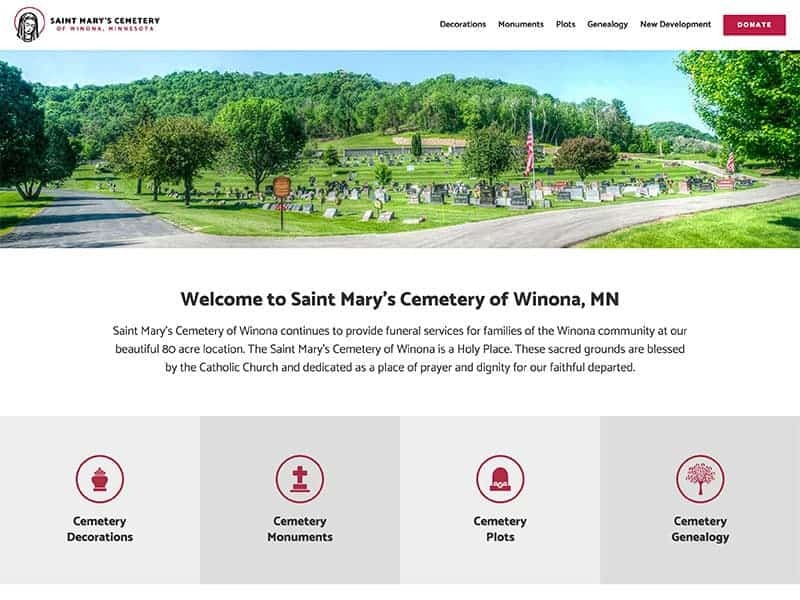 As a non-profit organization, Saint Mary’s Cemetery wanted an updated website that encouraged visitors to give donations to help the staff continue to care for the facilities and continue to grow their genealogy database. They also wanted to better emphasize the products and services that the cemetery provides. Our team reorganized the website’s information so that each service was highlighted in the menu and it was easy for visitors to navigate. Our team also helped utilize Google Adwords to help stimulate more site traffic. Do you need assistance reorganizing your website? Our team is happy to help!